I wrote a post a while back about getting the HP LaserJet 1012 installed on Windows 8.1 and a bunch of people asked if it was also possible to install it on Windows 10. Sure enough, it is! The instructions almost identical to installing on windows 8.1, but I’ve noted a few changes for Windows 10. Plug in the HP LaserJet 1012 via USB cable. Windows will try to install it and it will look like it’s installed but it wont actually work. You’ll be able to see it in the device manager as an “unspecified device”, but you wont be able to print. Download the Microsoft Windows Vista (64-bit) driver for the HP LaserJet 1012. We’ll use the Vista 64-bit version on Windows 10 with no issues. Extract the ZIP archive and make a note of the location on your hard drive. Click on “The printer that I want isn’t listed”. Skip the option for “My printer is a little older…help me find it” as that wont work. Select the radio button for “Use an existing port” and then select “DOT4_001” from the dropdown. Click “Next”. If you have more than one “DOT4_XXX” option make note that we may have to change something later. Give the printer a name, click next, accept any security warnings, etc. So if that didn’t work, you may have to revisit step 8 and change the port. 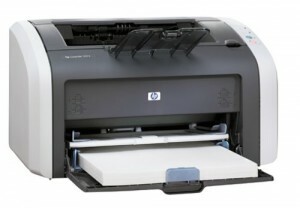 The HP LaserJet 1012 should be listed under printers. Right click and select “Printer properties”. Note that this is different from the old “properties” tab that was in previous versions of Windows. Select a new option and save the settings. You may have to do this a few times until it locks on to the port that the HP is assigned to. If you had previously elected to have it print a test page, it’ll come flying out automatically when you find the right port. Enjoy your old printer on your new Windows 10 machine! Perfect instructions and worked like a dream. Dave, thank you, worked great! Probably just because supporting drivers for every operating system is a challenging job. And it doesn’t sell new printers! Wow, this worked!!!! So happy! Thanks for sharing! For some reason the drop down box for the radio button “Use an Existing Port” is empty. Any thoughts on how this is? Thanks for the instruction. I had to make modification to Step #4 since it didn’t work for me. I went into “Settings” and selected “Devices”. I followed with Step #5 along with the remaining steps and it worked! This worked perfectly – thanks Dave! Thank you … I’m printing again … until the next Windows update. Wow great!! finally it works thanks so much! Dave, everything looked good, big step forward! When I print to the LJ 1012 from the connected computer running Vista, it works great. When I print to the LJ 1012 over the network from either Windows 10 computers, the output is streaked. Many blank horizonal lines neatly arranged down the entire page. I tried a PDF document and an Open Office text document. Any ideas? To be honest, I have no idea why there are streaks. I had a similar issue when printing in Windows 8 where watermarks from Microsoft Word only printed every other letter, and I assumed it was some kind of rendering issue that was incompatible with the way I implemented this solution. See Installing HP LaserJet 1012 on Windows 8 for more info on that, but I don’t think I’ve had that particular issue in Windows 10. As an aside, mainstream support ended for Vista in 2012 and extended support ends April 11, 2017. You may want to consider upgrading before April as there likely wont be any security patches after that time. I’ve installed Windows 10 on some pretty old and slow machines with no issues, but, as with anything, your mileage may vary. installing for windows 10 did not work because there is no mention of that Dot4_001 in my list any ideas? DOT4_001 may or may not exist depending on your configuration. If there is another similar one, try that. As others have said, these instructions are perfect, easy to follow and I can continue to use my HP1012 (for which I still have two toner cartridges). Thank you very much for the time you put into discovering how to do this and freely sharing it. Thank you so much, Dave! My printer lives! I’m doing a happy dance! Thank you so much for this solution. My favorite printer had been sitting on the shelf for months (with a fresh supply of ink), because I couldn’t find a solution. This absolutely worked!! Perfect. You helped me a lot! There is a driver for Windows 10 for the HP Laserjet 1015 which works very well. Good to know. I haven’t tried that driver yet. Thank you Dave and Ian!!!!! The vista 64 wasn’t available anymore but, I did get the 1015 64 bit. I had to putz a bit to get it to work. For other seekers, after running the new application in downloads, I went to add a printer, followed Dave’s instructions, but had to use the “Windows update” rather than “Have disk” then found & selected the HP 1015 driver. In next window, changed printer name to 1012. I have spent hours searching & trying to get this to work. I had gotten it to print test pages, but nothing else. Now it does. It would have been a real waste for me to have to toss this like-new printer, because I print very little at home. Hi I am still having trouble installing this HP Laserjet 1012 printer in a windows 10, 64 bit laptop. I also tried installing it using the 1015 driver Ian recommended. I really need help please! I also have a question, at then end of the process it is asking if you want to use the driver that is currently installed or if you want to replace the current driver. I tried both options but it it still didn’t work. Your instructions for drivers for the HP 1012 were exactly what I needed — except HP no longer has drivers on their site for this printer. It was your instruction to save to a different port if needed, so I used DOT4…002. Currently I believe HP has deleted any support for this printer. I have the files that I downloaded for another pc and after choosing “have the disk” and selecting file hpc1015w, it works just fine. THANK YOU — couldn’t have done it without your instructions. Dave, I have a HP-1012 printer. How do I download the Vista 32-bit driver? Last time, it was Vista 32-bit which worked for Win-7, but lets say I get another Win-7 32-bit system what then? Why can’t HP just let well enough alone, instead of discontinuing their old drivers? Or are there any easy instructions for me to copy the necessary file(s) from my Win7 system to any new 32-bit Win-7 system I may acquire? The reason I’d look for a slow system, is because I’m electrosensitive to speedy, dual-core systems. I feel so hopeless, given my situation. Well, all software manufacturers have to stop supporting old versions at some point and it’s just a business decision of how much time, effort, and money they want to invest on maintaining software for which they’re no longer selling hardware. And HP’s hand is somewhat forced by Microsoft who officially stopped supporting Windows 7 in January of 2015. Dave thank you SO much for responding. How long will your download-link be active? And which folder should the file be saved to when/if I’d get another Win7 system? It was even nightmarish figuring out what to do last time, because at first I had followed some instructions which hadn’t worked for me, so it dragged out forever, until finally, the Vista worked. I’d have to go back to my looong fiasco thread to try and decipher what exact steps might work. the next time around I seem to recall that it needed to be the correct combo of choices involving two drop-down menu’s at one point or another. And so help me, if i happen to click a “yes” during some choice which should have been “no” (or vice versa). I don’t suppose you know whether there are any decent options for someone like me these days, with a 14″ or 15″ Pixel-Qi easily-dimmable type of screen, as well as 1.6ghz or lower (not dual core), and no cordless mouse, no WIFI, and no touchscreen? Even better would be a Pixel-Qi type, with E-ink option. >> Dave thank you SO much for responding. How long will your download-link be active? I’ll keep this blog post up for a long time, but I don’t know if/when HP will remove the driver from their site. My recommendation would be to download the file and keep it somewhere so that you have it for future installations. >> And which folder should the file be saved to when/if I’d get another Win7 system? Just keep the file that you download and use the installer that way you don’t have to worry about migrating files and trying to replicate settings. No, sorry. That’s a pretty specific configuration and I wouldn’t feel comfortable making a recommendation on that. Sorry. So I assume I can just download it to MyDownloads folder, and from there, copy it to a folder on my USB stick? As for the installer, where would i find that? The installer would be the file you downloaded from HP. Dave, are the instructions on below link accurate for Windows 7? (not just XP/Vista? I don’t know specifically about the site you linked, but I recommend never downloading drivers from third-party sites because you never know what you’re getting. The could be legitimate drivers, or full of malware. Wow this is working…. but something weird append. Whatever is text or graphic, if i have more than 1 page, the printer stop for about 7-10 seconds between each page. For example, if i want to print a 12 text documents, the printer take 30sec to 1 minute to print the first page (the led green is blinking), after the page is printed, the green led still blinking and print the next page 7-10-15 seconds later. For 2 or 4 pages is “ok”, but withbig documents is taking sooooo much time to print, there is a very very big delay between each page. Yeah, that happens to me sometimes too. I’m not sure what the fix is. I sure hope I got the right guy to help me get my LaserJet 1012 back on the road. I got to set 4 and then I got lost…Hit Control-Q to launch the search charm and type in “Devices and Printers”. I don’t understand Control-Q? I unzipped the files but don’t know what to do with them. Sorry, for being a little thick, but that is just me. I do need your help, please. Oops – that was supposed to be Windows-Q! I fixed it in the instructions above. Thanks for pointing that out! thank you thank you thank you, Dave… after wasting almost 2 hours i found your instructions on amazon comments and was able to install the driver on my win 7! my goodness, HP supports is so useless and convoluted! I was so happy to have the promise of being able to use my 1012 again. Although I’m not talented I did follow your instructions for use with windows 10. Needless to say my computer was configured a little different in some ways but it did seem to be working out in the end, except that I get no response from the printer. I tried going through the process again, no change. The printer works and the computer reports that it’s all fine. I’ve clicked PRINT from several different spots and got the message that it had been sent to the printer but and no response. Nothing in the printer queue . So now I’m sad again. Is there any hope? Woo-hoo! Thank you, you are awesome!! Great tutorial, for those who don’t see the DOT4_001, download the driver for 1015 in HP.com, then proceed with this tutorial. So I have done this and still no DOT4 showing up…any suggestions? Is there another DOT option to explore? You can manually create the port, but it involves a few extra steps. Thanks so much on this one, this comment saved me. Now I can print as well 🙂 Thanks!! You are the MAN! You helped us when we got a Win 7 laptop to install our HP Laserjet 1012. When we got a Win 10 laptop you came through agin helping us install the HP Laserjet 1012. Thank you. THANK YOU THANK YOU THANK YOU!!!!!!! Like many others you have helped, I am extremely grateful for your instructions in getting my HP Laserjet 1012 back on the road. I am not a techie and was so frustrated when I bought my Windows 10 computer to discover my printer was not compatible. Of course, I still had a full cartridge of toner! After months of having to sneak to print a few pages at work or having to travel to the library I decided to just buy a new printer. The prices weren’t bad but something told me to try one more time to get my printer to work. Remember, I am not technically proficient, but your instructions were clear and after mucking around a bit I have achieved success. You are a GEM! Thank you so very much! Glad it saved you from buying a new printer!